Over the summer months, twenty of the string players met on five evenings for our now firmly established Summer Strings. We were joined by a few non-CAOS players who we hope will be encouraged to join the orchestra when we start rehearsals in September. New music for this summer included Warlock’s Capriol Suite, Shostakovich’s Waltz from Jazz Suite No. 2, Leopold Mozart’s Sinfonia di Camera and Scott Joplin’s The Entertainer. At each rehearsal we played Strauss’s Pizzicato Polka with the objective of improving our ensemble pizzicato which has been described as “scatter-gun” by our conductor. Time will tell if this has been beneficial. 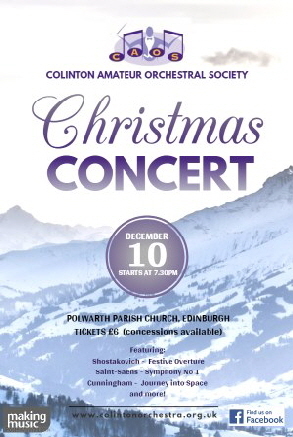 Some old favourites such as Karl Jenkin’s Palladio and Corelli’s Christmas Concerto were also played. Suggestions for next year’s music will be welcome. The format of this year’s Christmas concert was a departure from our normal. We opened and closed the concert with Christmas carols that got the audience involved. After Shostakovich’s Festival Overture, the first half continued with a number of short works played by small groups from the orchestra: Rutter’s Pie Jesu played by a brass quintet, the fist movement of Gounod’s Petite Symphonie played by the wind section, Karl Kenkin’s Palladio played by the string section and Mascagni’s Intermezzo from Cavalleria Rusticana arranged for horns and trombones. Douglas’s What a Wonderful World also arranged for horns and trombones brought the first half to a close. After the interval we played Journey into Space by Tom Cunningham, a local composer, who was in the audience and then the main work - the First Symphony of Camille Saint-Saens. Our Christmas concert kicked off with Schubert’s Rosamunde Oveture. This was followed by an arrangement of Sibelius’s Finlandia for brass quintet. The string section of the orchestra then played the Symphony No. 1 “New Year Ode” by William Boyce. This was one of the works that we played during our Summer Strings evenings earlier in the year. This was followed by a different brass quintet that played Wagner’s arrangement of Silvestri’s Polar Express. 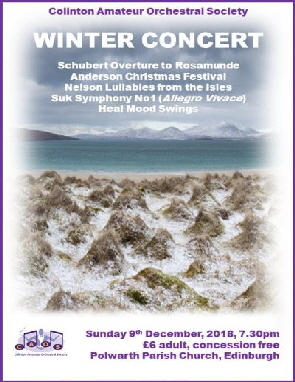 The first half ended with the evening’s world premieres - Lullabies from the Isles - three traditional Scottish lullabies arranged for orchestra by local composer June Nelson. The second half of the concert opened with the third movement of Symphony No. 1 by Josef Suk. We will be playing the complete symphony in our next concert. The second of the evening’s premieres followed - three movements from the suite Mood Swings composed by Tristan Heal, a violinist in the orchestra. The concert ended on a festive note with Leroy Anderson’s Christmas Festival - a rousing arrangement of traditional carols and Christmas tunes.